Translation Tribulations: Atril is dead! Like any site managed by the clueless crew formerly known as PowerLing, the content is unfinished, chaotic and will probably mutate into something over time. And yes, it is true that Jesus is coming soon. He's tired of waiting for the promised new version of Déjà Vu to be released first. Atril and its product Déjà Vu were critical to my translation business for many years. But markets evolve, and the product has failed to evolve with them in an effective way. 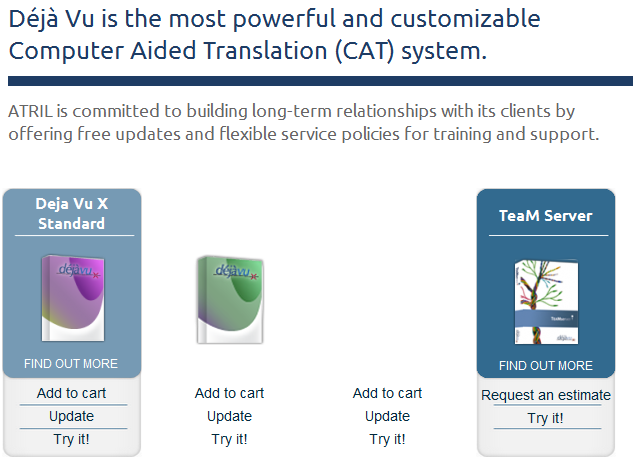 Right now if someone were to ask my recommendation for a translation environment tool offering a broad scope of source format access and good productivity features, I could not recommend this tool with a good conscience any more. I think the best picks for freelancers these days among the commercial tools are probably SDL Trados Studio if you like pain, memoQ if you prefer pleasure. For LSPs and corporate users same deal (memoQ being the best for performance, flexibility and ease of maintenance, SDL being... well... SDL) unless you need something like the Ontram workflows for your production of marketing brochures. FWIW, I'm sticking around for a while to give the new set-up a chance. PL was not my favourite flavour for a sales organisation (as I said clearly in several places), but at least they have now started to respond to e-mails and make changes after constructive criticism. If you look at the "About us" section (link at the bottom of the page on atril.com), you will see some of the familiar names. The standards for a responsive CAT company are high (having been set by people like Emilio and the folks you have come across at MemoQ), and the Atril/Powerling combo has a way to go, but at the end of the day it may yet transpire that the rumours of Atril's death were rather exaggerated. I hope the report of death does indeed prove to be exaggerated, Victor, but in many respects the company has been six feet under for years and PowerLing was just a patch of flowery weeds growing on the grave. Even the server solution released a year ago was too little, too late. In all the time where you and I have waited for upgrades and the new version, technology has moved on. There has been far too little of the spirit that we both knew from the company's founder and which will remain a benchmark of support quality for me as long as I'm in this game. The waiting game with Atril/PowerLing has been far too much like Beckett's play, and I simply want to get my projects done efficiently, bank my profit and move on. Increasingly in recent years, the outdated aspects of DVX have stood in the way of this, and I've been disappointed in my expectations so many times that I will not expect a change now. Nonetheless, I do hope I'm wrong. We need more viable competitors in the CAT/TEnT world. I've been a user AND a fan of DVX for years, but after the ridiculous stunt of last September ("DVX2 will be available in two weeks!") and, also, the general attitude I've encountered when asking for news and clarifications on the Yahoo list... I jumped on the MemoQ wagon a few months ago, and now I'm really happy. So, I'm definitely with Kevin in this. However, I must admit it's very sad. Pity. I was one of the very first users of DV (I may still have around a 3.5" installation disk with S/N 27). Emilio's support was awesome, way back then. Since the companies where I worked adopted afte I had bought that first copy of DV used a series of different CAT tools, I never had a chance to play with newer versions of DV, and I suppose now I'll never will. DV was Emilio Benito, memoQ is not just the Kilgray people who made it.